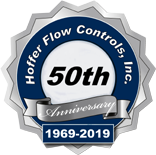 Hoffer Flow Controls is a supplier of flow products to various agencies within the U.S. government including the Navy. We have supplied flowmeters and flow switches for a number of shipboard applications. Our customers, along with the U.S. Navy, include prime contractors such as Ingalls Shipbuilding, Bath Iron Works, and Newport News Shipbuilding. Systems supplied to these customers include fuel flow measurement systems for the propulsion plant, missile cooling systems, trim and drain systems and flow switches for use in the fire control system. Recently, we have worked with a major supplier of reverse osmosis (“R/O”) systems for use on the U.S.Navy DDG-51 Class Destroyer. This class of ship, which carries weaponry for battle, is 505 feet overall in length and carries a crew of 341. Hoffer is supplying the turbine flowmeters used on both the supply and discharge sides of the R/O systems. The R/O systems will handle “all” shipboard water requirements. 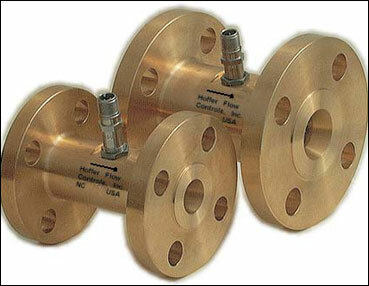 The supply side flowmeters are suitable for use on seawater, thus, they are constructed of naval brass and monel. These materials provide long life against seawater’s corrosive nature. The flowmeters on the discharge side are constructed of 316 stainless steel and will meter the potable water. All flowmeters will supply simultaneous pulse and analog outputs that will be fed to the ship’s main control room. Historically, the Navy has employed gauge type flowmeters whereby the “roving watch” was responsible for taking and recording readings. The information obtained from the supply and discharge flowmeters on the R/O plant enables the crew to determine the efficiency of the R/O system. The use of the Hoffer turbine flowmeters, with precision output flow information, will enable the Navy to minimize manpower requirements onboard the vessel. This is one of the design goals on this class of ship. The Hoffer turbine flow system incorporates a robust design that has been tested to meet Mil-S-901D shock requirements, Mil-Std-167-1 mechanical vibration requirements and Mil-Std-462D EMI requirements. The Hoffer flowmeters have been first article tested and certified by independent laboratories to meet these Military standards. These flow systems are available in a variety of sizes supporting flow ranges starting at .25 GPM through 12,000 GPM. The Hoffer “Navy design” turbine flowmeter is well suited for this application because of the robustness, versatility with regard to construction materials, and reliability. “Bath Iron Works had recommended that the R/O system manufacturer contact Hoffer for the turbine flowmeters needed for their system,” according to Linda Markham, account manager for the project. “This speaks volumes about the long term reliability of the Hoffer systems,” she indicates, “because Bath Iron Works has been using the Hoffer turbine flowmeter for a variety of shipboard applications for years.” Now in addition to supplying flow systems for the propulsion plant and other critical shipboard flow processes, Hoffer has also provided a solution for the R/O water plant. Hoffer provides flow systems for simple and customized applications. Call us today with your flow requirements.